Swedish company Minesto's underwater kite resembles a child's toy as it swoops and dives in ocean currents. 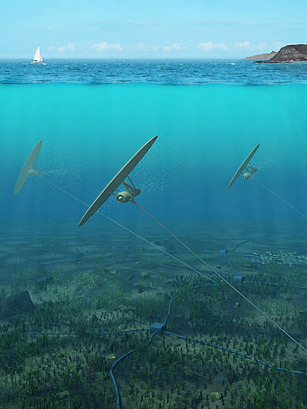 But since seawater is 800 times as dense as air, the small turbine attached to the kite  which is tethered to the ocean floor  can generate 800 times more energy than if it were in the sky. Minesto calls the technology Deep Green and says it can generate 500 kilowatts of power even in calm waters; the design could increase the market for tidal power by 80%, the company says. The first scale model will be unveiled next year off the coast of Northern Ireland.